When Judy Blume’s classic “Tales of a Fourth Grade Nothing” was published in 1972, it might have spawned a craze for pet turtles. In the story, Farley Drexel Hatcher, AKA “Fudge”, satisfies his hunger by swallowing his older brother’s tiny turtle, carapace and all. Whether the book inspired America’s reptile infatuation or was a symptom of it, the 70s was a time when turtles became popular pets. It was also a time when we noticed a spike in salmonellosis. In 1975, the FDA passed a new law that banned the sale of turtles with shells smaller than four inches. The reason for the new law was that 90% of reptiles are asymptomatic natural carriers of the salmonella bacteria, which can cause bloody diarrhea, vomiting, fever, and a possible risk of death for small children and elderly. 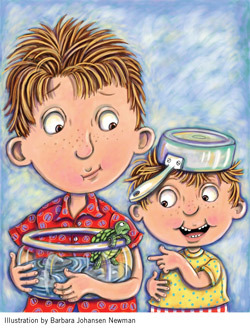 The law targets smaller turtles because they are more likely to be inappropriately handled by toddlers with curious mouths, like Fudge from Blume’s books, but also because they are more likely to be sold in pet stores. The CDC estimates that the turtle law has lowered the incidence of reptile salmonellosis by 100,000 each year (a reduction of 77%). Owning a pet turtle might seem worth the risk of salmonella, but they are not easy to raise. It’s estimated that about 90% of pet turtles die within the first year of being adopted into a family, a statistic explained by a general lack of understanding on how to care for reptiles. Even if turtles seem healthy and clean, and even if they have been kept indoors, turtles are still just as likely to be carriers of salmonella (it doesn’t make them look visibly sick). There’s been a campaign to raise salmonella-free turtles by sterilizing their eggs, but even that has not been proven to effectively reduce the turtle’s chances of carrying salmonella during it’s lifetime. If you spot a pet store selling baby turtles, you should report them to your nearest office of the FDA. The reason I wrote this post was because a volunteer for the museum in Cincinnati was showing my kids “Shelly”, a rescued turtle with a prosthetic shell. I innocently asked whether it was a myth that turtles are more prone to carry salmonella, and the volunteer couldn’t answer the question. She said that since the pet was kept indoors, it would likely not be infected (not true), but she followed with the promise that she asks children to wash hands after touching it (also probably not true). I thought I’d research the topic and share the info with you.